For quite a while now, we’ve had navigation devices that will talk to us. Did you know that now you can talk to them? I’ve heard a lot of people complaining with the latest version of Google Maps that there are too many steps to get it to start navigating. If you simply talk to your phone or tablet and tell it to “Navigate to _____________” That’s all you have to do! If you have an Android phone or tablet with Google Maps, you can long-press on the Search button and a microphone should appear. At that point you can either tap the microphone, or just say “Google” and your phone/tablet will be in listening mode. This is called Google Now. If you just say “Navigate to _________” it will get the ball rolling – no typing required. It may offer you some choices that you can tap, or if you do nothing, it will pick the first choice and start navigating. If you have an iPhone or iPad, then you talk to Siri. To start Siri, press and hold on your Home button – the circular indented button below your device’s screen. It should be obvious when she’s ready to listen and you can say the same words, “Navigate to ___________” Siri may ask for further clarification, but then she’ll start the navigation going. On an Android device it will be Google Maps that is accessed by your voice commands. 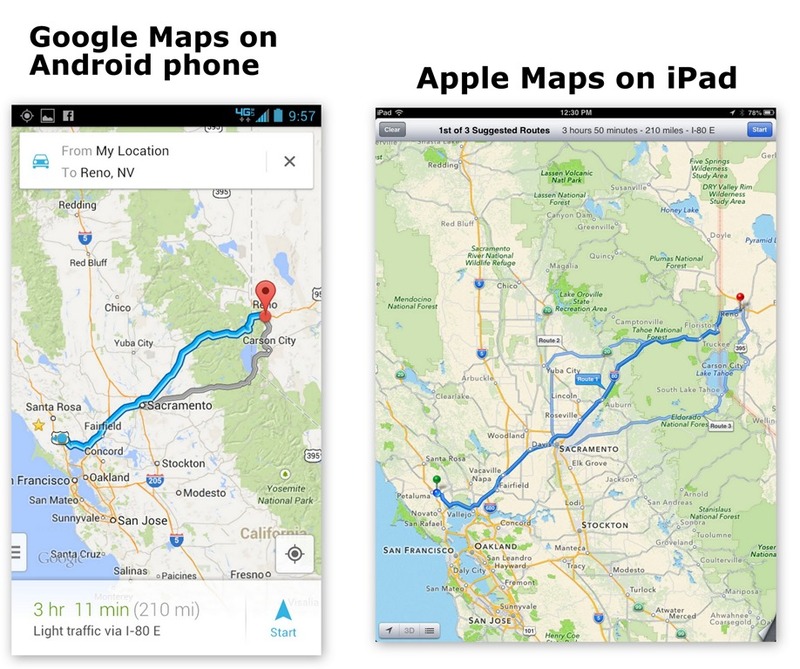 On an iPhone or iPad, it will be Apple Maps. Your device may not have the necessary hardware or software installed. You will need a device equipped with a GPS – most all phones will have this, but it may be missing on some tablets. You also need an Internet connection – once again, phones should have this (if you’re in range of a cell tower) but you may need a Wi-Fi connection for your tablet. Siri requires a 4S or later iPhone, and iPad 3 or later. Google Now requires Android ‘Jelly Bean’ 4.1 or higher. If you are a Member, you can go to www.GeeksonTour.tv, click on the Learning Library and the Smartphone section, then play video mobl19.Talk to Navigate; Android or iPhone/iPad. Published by MrsGeek, in Blog. Tagged with Android, Google Now, iPhone navigation, Siri, Voice commands to navigation. Hello- I do not find the link to the video for a particular topic a smooth path. For example, on the latest piece regarding navigation which came to me on my email, it was simply the notice that the video existed and a little intro. So I clicked the link, logged in and them where do I go? I typed in mobl19 and that did not take me to a video. Is there something that I am missing here?